Abstract : The simulation of one particle in a magnetic toroidal field is carried out . 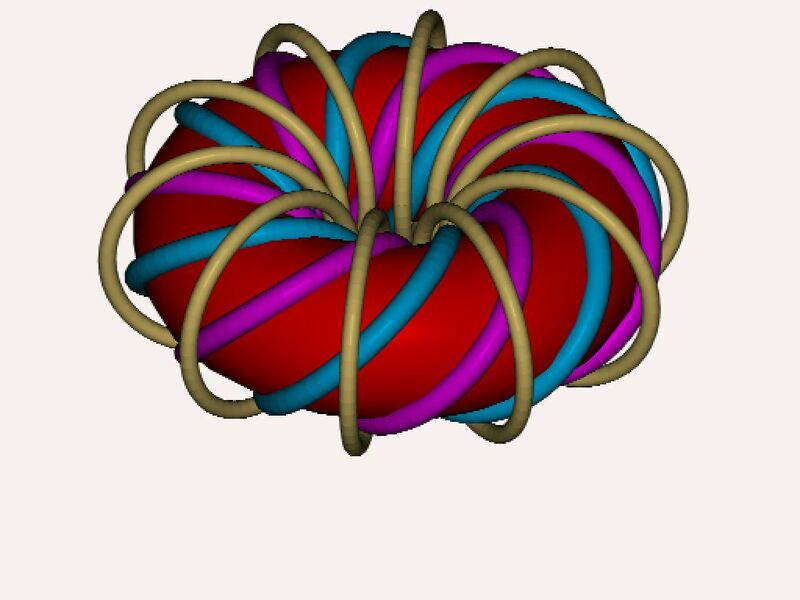 The objective is to know and visualise the magnetic surfaces of a classical stellarator using a previous code for Monte Carlo simulation of particles. The code is implemented in Java and improves of one previous code . A classical stellarator is chosen because it does not contain PF coils. Although different methods exist to calculate vacuum magnetic field lines and magnetic surfaces given a set of filamentary currents, in this case they are calculated using one only particle which freely evolves inside the torus so to obtain a magnetic surface. The part of the code that calculate velocity drifts is switched off in order to obtain the magnetic field lines. 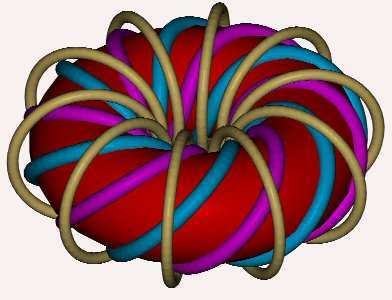 The only objective of the code is to have a basic tool to know the magnetic field distribution in a torus. Until a common code used in fusion research-engineering, such as EFFI code or perhaps IFT code were available, if possible, this code is the only alternative. As an engineer focused in fusion engineering issues, a deep knowledge of plasma behaviour falls out of my intention and possibilities. The code is named SimPIMF and is implemented in Java to try to take advantage of the numerous and public mathematical libraries available, like Colt (CERN libraries) and java.vecMath. The vacuum magnetic field is obtained using MEMCEI v2.1 code . The model is a classical stellarator with l=2 m=6 that have similar dimensions to CTH , a torsatron in Auburn University. CTH is a l=2 m=5 torsatron. However the classical stellarator modelled here has no any good mechanical and plasma properties and it is only a first try. The current used in this calculation is 100kA for each helical coil and 50kA for each of the 10 toroidal coils. In the Graph 1 the structure of the coils is shown. The geometrical major radius is 0.75m. The section of the coils is the section used in MEMCEIv2.1 as the section of the circular winding. If the section of the winding is rectangular more cylindrical currents per coil might be necessary to increase precision near and inside the conductors. From 1 to 4 Msteeps of 10 picosecondsa and Te=1keV is used to simulate the particle and the calculations are done following the explanations in Dolan  and are described in . The result obtained when throwing one electron from different points inside the stellarator are displayed in Graph 2 and 3. In Graph 1, in white colour, the poloidal section of the trajectories of an electron on a q=3 magnetic surface is represented. 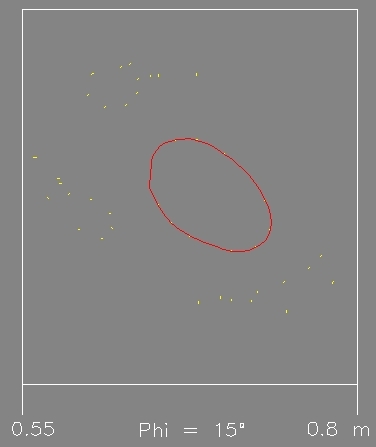 In yellow (expand the figure), the trajectory for a q slightly higher on an outer surface. 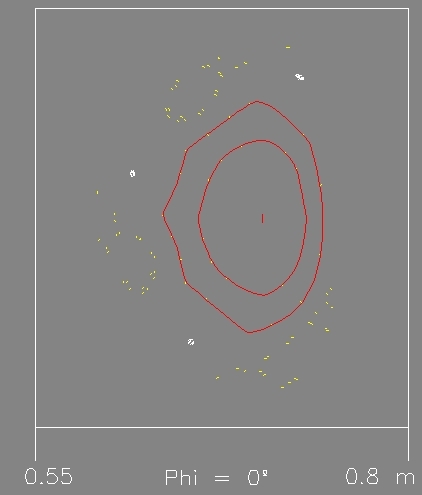 Big magnetic islands have appear for Iota =1/3. 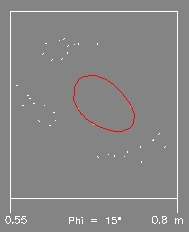 In red, two closed magnetic islands are represented for indeterminate values of q. SimPIMFv1.0 code cannot calculate values of q since this code only simulate particles in a basic way. 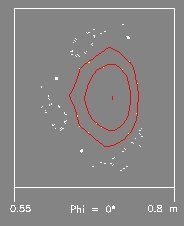 Graph 3 shows only two magnetic surfaces at 15º toroidal angle. A code like EFFI might be useful to test and compare this results and as a better way to do the same. The knowledge of dimensions, currents and coils of the mechanically simple CTH stellarator would be also useful. "Design and construction progress of the compact toroidal hybrid" Hartwell, G.J., Knowlton, S.F., Watt, C, Hanson, J.D. , Brown, T.
 "Development of a basic code for Monte Carlo simulation of trajectories of plasma particles" Vicente M. Queral . See “Past research"
 "Magnetic field and forces calculation using MEMCEI v2.1 finite element code. Analysis of the convergence of the solutions" Vicente M. Queral . See “Past research"